Julia Maria Ixchop Us De Ventura never stops working. Every day, she bustles to make hot meals in her packed restaurant in the Boca Del Monte market in Guatemala City. 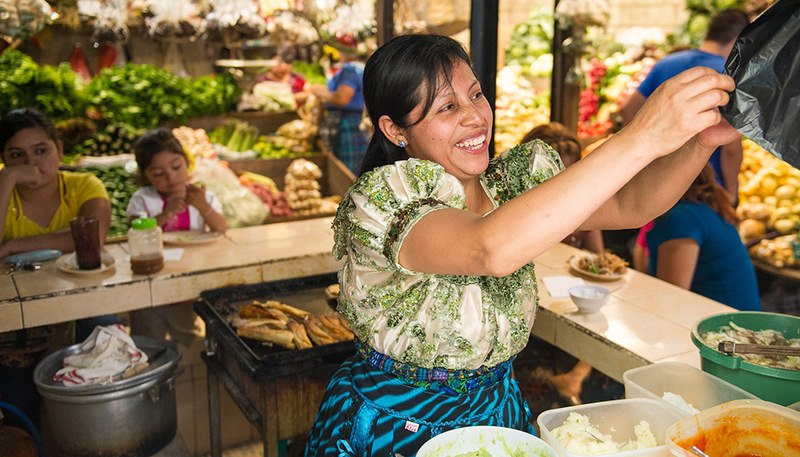 From 7 am to 1 pm, she, along with her husband and one employee, make a variety of Guatemalan food, including her specialty, dobladas – a warm tortilla filled with meat and topped with a salad and sauce. “I only take Christmas and Easter off,” she says. Julia’s drive to provide for her family didn’t just come out of her passion for cooking; it also came from necessity. Like so many female FINCA clients, Julia had to become the primary breadwinner for her family. Eighteen years ago, when Julia’s husband could no longer support the family due to his alcoholism, she decided to work outside the home for the first time in her life. She began to sell food on the street outside the market to make ends meet. The work was tough, and though selling food helped to feed her growing children, she couldn’t afford their school fees. With Village Bank loans from FINCA, Julia expanded her business and placed her six children back in school. As her dishes gained fame, she was able to rent a space inside the market. Eventually, she upgraded to FINCA’s individual loans, which have helped to pay for her stove and pans and for renovating the seating area of the restaurant. Today, her corner restaurant is named after her daughter Katy. It occupies three rented spaces in the market and consists of a kitchen, a seating area and a dishwashing area. Julia takes pride in serving as the lifeline for her family. Her husband, who has been sober for 12 years, works side by side with her every day to help put their children through school, renovate their home and support their aging parents.